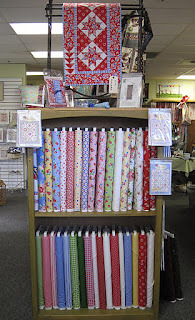 Yesterday I went up to Danville to Wooden Gate Quilts to drop off Elizabeth's new quilt Pam's Garden and Emma's English Posies, for display in their PKM fabric area. 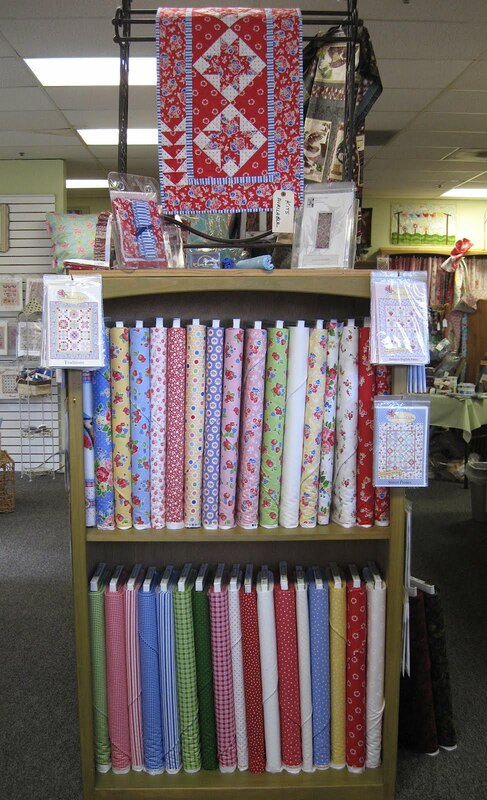 You know I've seen a lot of photos of my fabric in shops now, but somehow opening the door and seeing this right as you walk in .. well words can't express it. And its wonderful to pet to Pam! But I am going to have to get serious and cut into it soon! I got the ENTIRE line for Christmas! Just petting it now. Almost too cute to cut! They really love you there! Really I visited that shop a few times and they love you! They are sweet ladies too. I'm guessing that's a bigger pick-me-up than coffee. Such a pretty way to greet the customer too. I thought I heard a scream coming from the west the other day! Must have been you! Congratulations!!! I desperately need this fabric!!! So wonderful Pam....and ps..hope your head is ok! :-)! Love it! I can't imagine what a wonderful feeling that must have been. Why doesn't anyone carry it around here? My LQS carries cheap but still good fabrics and the other one should have this but does not. Time to shop on the computer I guess! Isn't Marby wonderful! It is really so fun to know that you get tickled over this... when you are the rock star! Congratulations on your fabric line. I have some.. .but it's nice to know where there is more!!! They know a good thing when they have it! I really appreciate that you don't take your success for granted, nor do you have that big ego a lot of designers seem to get. You seem like a regular person. Congratulations.